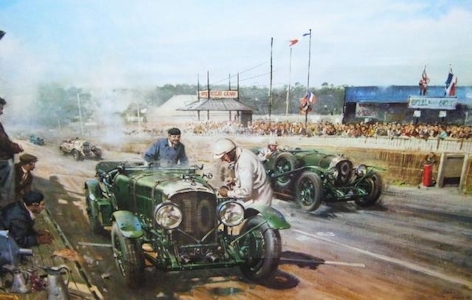 Terence Cuneo’s two paintings of the 1929 Le Mans Bentley pit stop and the Blue train racing against Woolf Barnato’s Gurney Nutting Speed Six Bentley saloon must be amongst the most reproduced motoring works. But how many people are aware of the full range of his automobile art? Particularly in view of Terence Cuneo’s wide range of output from railway artist, royal court painter, military artist, wildlife artist, portrait artist or chronicler of famous events. How did he have such a painting style that allowed him to be so interested in the mechanical detail yet be able to handle the general scenes and landscapes? Terence Cuneo was born in London in 1907 the son of artist parents. His father Cyrus Cincinnati Cuneo was American born into a large Italian family. 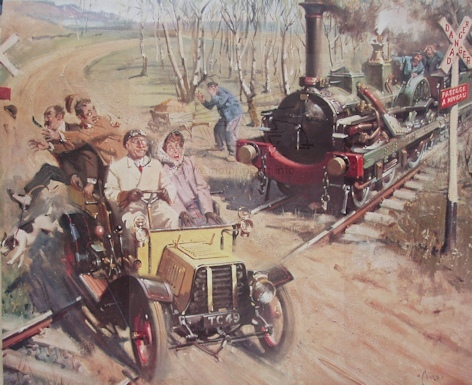 Terence Cuneo from an early age was interested in mechanical things, principally railways but by the age of thirteen had been learning the basics of driving a friend’s Wolseley limousine and by the time he was sixteen he had acquired a New Imperial motorcycle. Terence Cuneo says in his autobiographical art book ‘The Mouse and his Master’ that the bike was extremely unreliable and taught him a lot about mechanics. At the age of around eighteen he bought the first of two Morgan three-wheelers that he owned. Then came a sequence of cars such as Morris Minor, various AC’s, Bentley, Bristol 406, Bristol 408, and finally Bristol 411. Terence Cuneo studied art at the Chelsea College of Art and the Slade. During the 1920’s and 1930’s he made a living in a similar manner to his father contributing illustrations to many magazines such as Illustrated London News and World Wide Magazine plus he contributed to children’s annuals. He recalls that in the early days his father’s name was of great assistance in gaining introductions to Editors etc. To supplement his income he also drove a London bus at one period. Fortunately he became successful in his illustration work but it did involve long hours working to short deadlines. 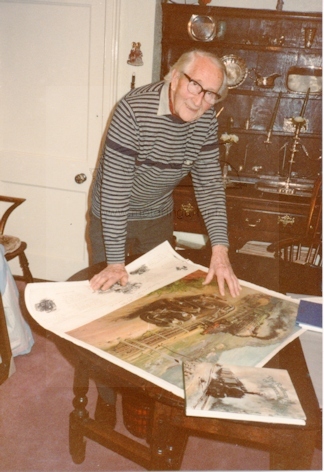 During the war Terence Cuneo was a successful war artist working for the War Office and later the appointment to work with the War Artists Advisory Committee. Earlier in the war he had been approached by Studio Books to write and illustrate a book called ‘How To Draw Tanks’; this went through several editions through the years. This is a companion volume to the Frank Wootton’s books on ‘How To Draw Cars’ and ‘How To Draw Planes’. As the war ended commissions from industrial clients rapidly increased. 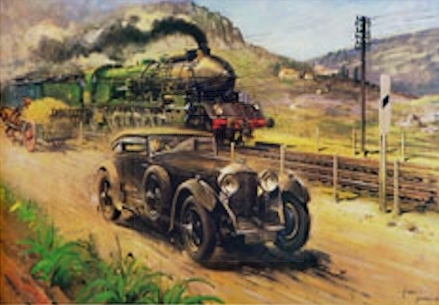 One of the important industrial clients was the Railway Companies and he commenced the superlative posters, which will be a permanent reminder to the quality of his art. These combine the talent for scenery with the mechanical detail and understanding of the locomotives, particularly impressive as they were often reproduced as large size posters. 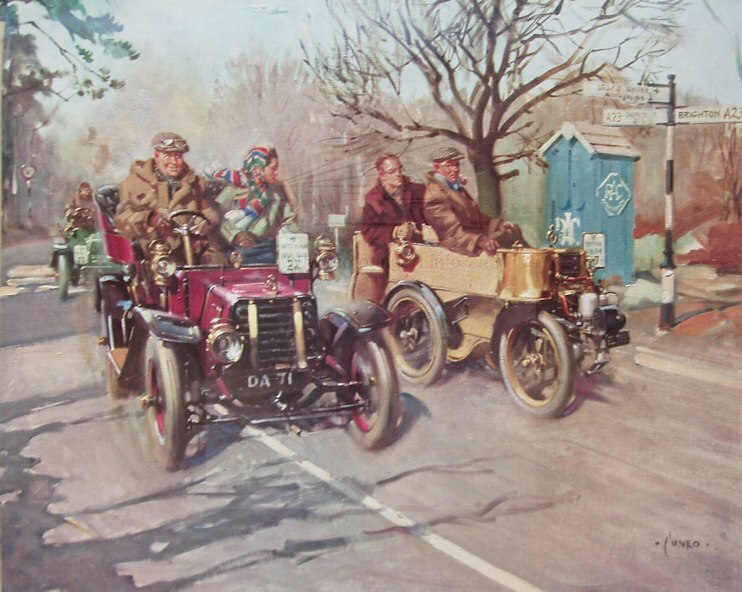 It is believed that Terence Cuneo’s first motoring commission was for The Autocar, when he painted a scene of a modern car overtaking a veteran car preceded by a man with a red flag. This was a special anniversary issue for the 50th year of the magazine 1895 – 1945. 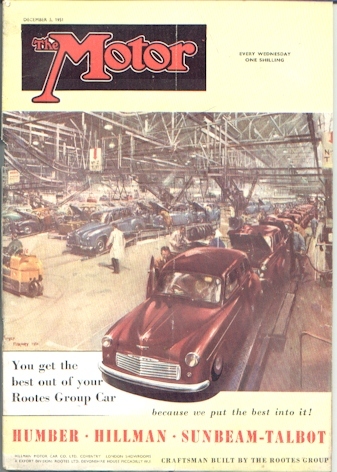 He also produced other front covers for both The Autocar and The Motor particularly featuring Rootes Motors products. 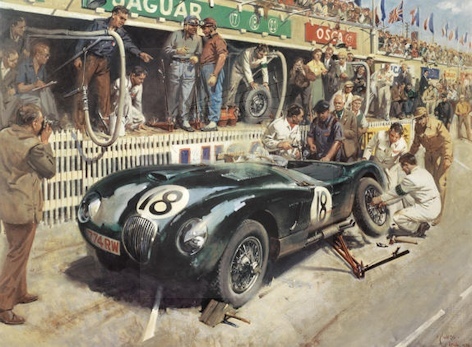 In the 1960’s he was asked by the Rootes Group to produce a series of paintings showing the famous cars in the Company’s history that were incorporated into a calendar. 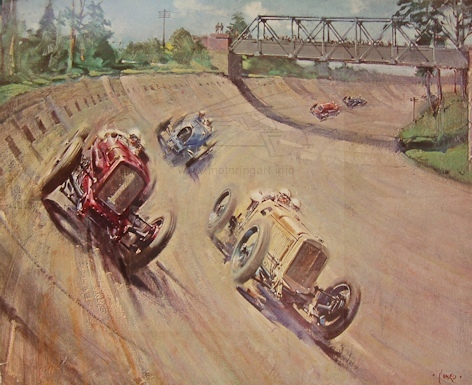 The early racing and record breaking Sunbeams were to the fore. 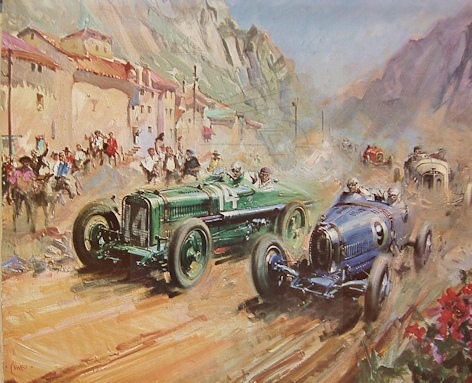 Terence Cuneo expended considerable time researching the cars and backgrounds. 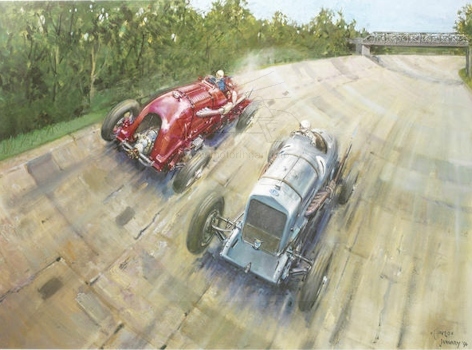 For example for the picture of Chassagne in the record breaking V12 Sunbeam he drove his own Bentley along the Brooklands banking then he sketched the scene through the open sunshine roof. 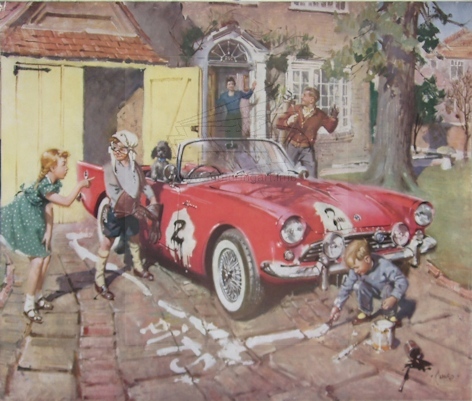 In addition to the Rootes calendars Terence Cuneo also produced art for calendars for Dunlop at least from 1962 to 1970. These were just single sheet illustrated boards with a calendar attached at the base. The illustrations were printed onto textured board and when they are framed under glass can look at first sight to be an original. In addition to the Rootes and Dunlop calendars he also did work for road safety calendars. Further industrial commissions came from other motor industry clients for advertising material and sales brochures such as diverse as Alvis, Ford and Armstrong Siddeley. Resulting from one of his commissions Terence Cuneo was asked to be the official artist for the official Coronation at Westminster Abbey in 1953. Whilst working in the studio on this large canvas, he was joined by the family cat that brought in a small field mouse. As a distraction he painted a ‘still life’ of the mouse, which was exhibited at the Royal Watercolour Society summer exhibition. This generated a lot of interest with requests for further commissions. This gave the idea to include a mouse somewhere in the picture of subsequent finished works. 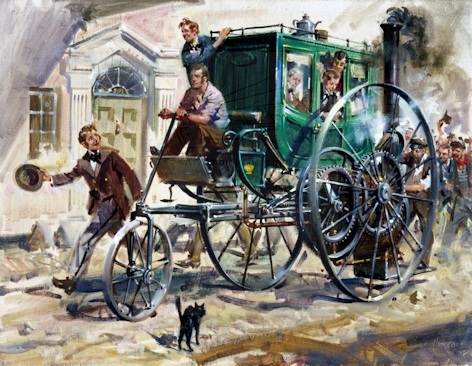 Finding the mouse is a popular search for people viewing Terence Cuneo’s later works as he showed considerable ingenuity in making the mouse inconspicuous but never hiding the little creature. This mouse foible was extended to anthromorphised pictures of mice, his large picture of the French Grand Brie (sic) being an excellent example. 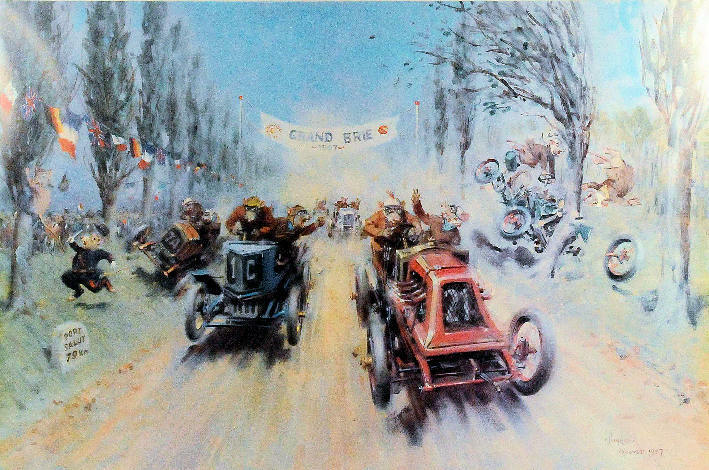 It is a scene from the 1907 French Grand Prix with the cars being driven by rodents. 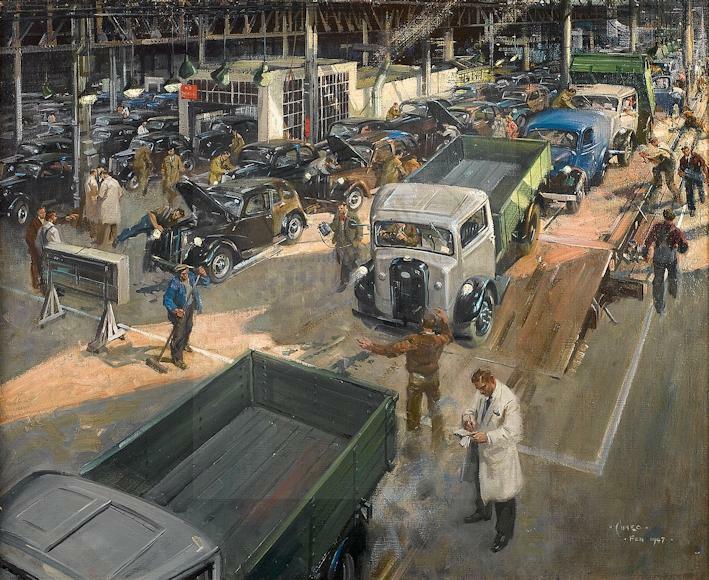 Terence Cuneo was one of the great artists of the twentieth century and we are very fortunate that he included so many motoring subjects in his portfolio. In his honour a statue of the artist was unveiled by the Princess Royal at Waterloo Station in 2004. C Type Jaguars at Le Mans.